Actor Dan Starkey, who is best known in his current semi-regular supporting role as the Sontaran Strax, has been entertaining fans at a WhoYork event at the Stone Creek Tavern in New York on 21st June. He was taking questions from a crowd of eager Whovians when someone asked if he would ever consider performing more Songtaran Christmas Carols like those which formed part of last year's Adventure Calendar. He suggested an entire album of Sontaran covers, and then began to regale his audience with snippets of potential tracks: Wild Thing, Send in the Clones and War, What is it Good For? (everything, apparently). Guardian blogger Martin Pengelly was there to record it and you can hear it via his blog post on the Guardian website. 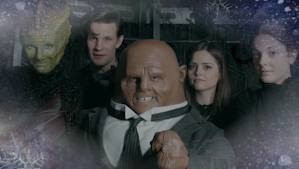 Starkey was also asked what he thought about the possibility of a much sought-after spin-off series centred around Madam Vastra's Paternoster Gang of which Strax is part, along with Vastra's wife, Jenny. His reply? "I'd give it serious consideration." We're no closer to it happening, I suppose, but it is good to know a cast member is at least partially on board with the idea... Hey, we can all dream, right?